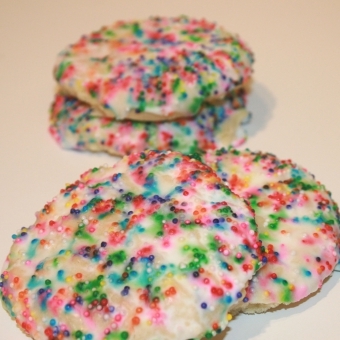 Our Rainbow cookie is a shortbread cookie with a powder sugar glaze and brightly colored sugar balls. This cookie is a favorite with the kids. And parents, its not messy so let them eat Rainbows! Size: -- SELECT -- Rainbow Cookie 12 ct.Rainbow Cookie 24 ct.Rainbow Cookie 36 ct.Rainbow Cookie 72 ct.Rainbow Cookie 108 ct.